Typically materials used in one load would be 15 pounds of hydro seeding mulch, the appropriate amounts of seed for 650 square feet (any seed will work in hydroseeding), and the appropriate fertilizer for 650 square feet (liquid, water soluble, or granular). 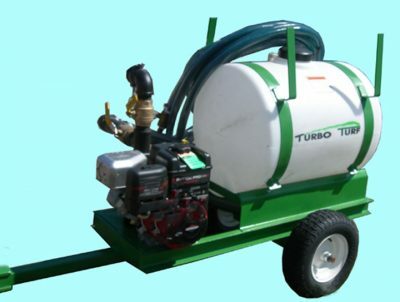 Like all TURBO TURF systems, the HS-50 comes equipped with a long life poly tank that can never rust, the ability to mix partial loads, a simple but powerful design with few moving parts, continuous agitation, and the ability to control the flow at the gun without making adjustments at the unit. Prices quoted are a complete machine ready to operate. Any trailers shown in the photo’s are optional. Material is applied at approximately 30 G.P.M. Time to spray a complete tank is approximately 2 minutes. Mixing time is 2 to 5 minutes depending on material. This unit comes with 50′ of discharge hose. the spray distance with the straight nozzle is approximately 40′. Typical materials used in one load would be 15 pounds of paper hydro seeding mulch or 20 pounds of a pourable mulch such as Cover Grow or EZ Mulch AF, the appropriate amount of seed for 650 square feet (any seed will work in hydroseeding), and the appropriate fertilizer for 650 square feet (liquid, water soluble or granular). Like all TURBO TURF hydro seeding systems the HS-50-P comes equipped with a long life poly tank that can never rust, the ability to mix partial loads, a simple but powerful design with few moving parts, continuous agitation, and the ability to control the flow at the gun without making adjustments at the unit. Prices quoted are for a complete machine ready to operate. This unit used a 2″ x 2″ centrifugal pump with an output of –160 gallons a minute of flow and 37 P.S.I. of pressure. This pump has provided excellent performance and durability and it is easy to service and maintain. There are no grease fittings and the only maintenance required is to winterize if at the end of the season if it is stored where temperatures go below freezing. The pump impeller mounds on the end of the engine shaft so there is no power loss. Typically it can operate for 5 to 10 years with no maintenance. The only thing to be careful of is to not run it dry. This unit comes with a 6.5 H.P. Briggs & Stratton recoil start engine. This has proved to be a very reliable engine with a long life. The engine has a two year warranty and service for the engine is available at any authorized Briggs & Stratton engine dealer. 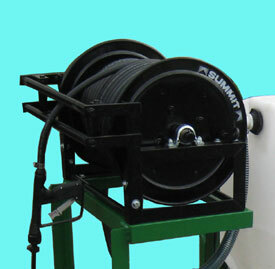 This unit comes standard with 50 ft of 1 1/4″ I. D. hose. The hose we use is both strong and light weight. It is made from a poly material with a spiral reinforcement. Additional hose is available in 50 foot sections. The unit will handle up to 150 feet of hose. 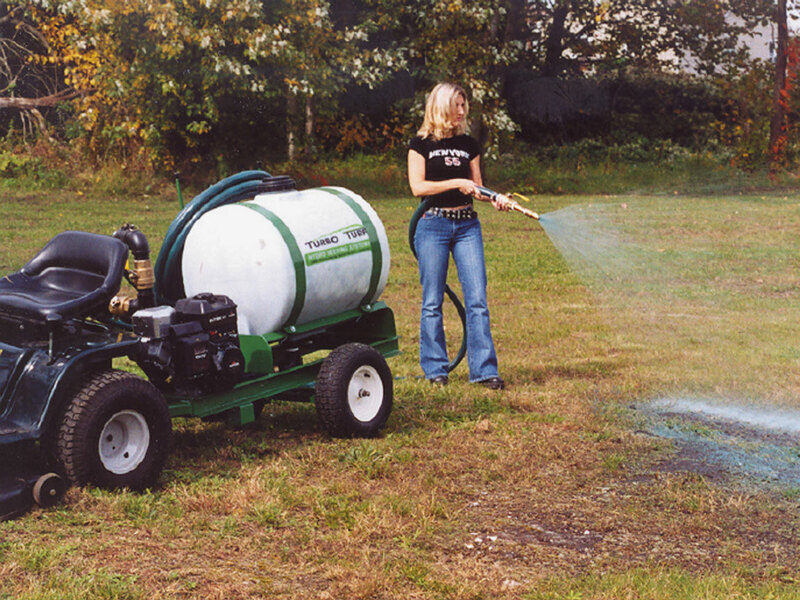 The HS-50-P is a pull type unit that can be pulled by a tractor, ATV or utility vehicle. 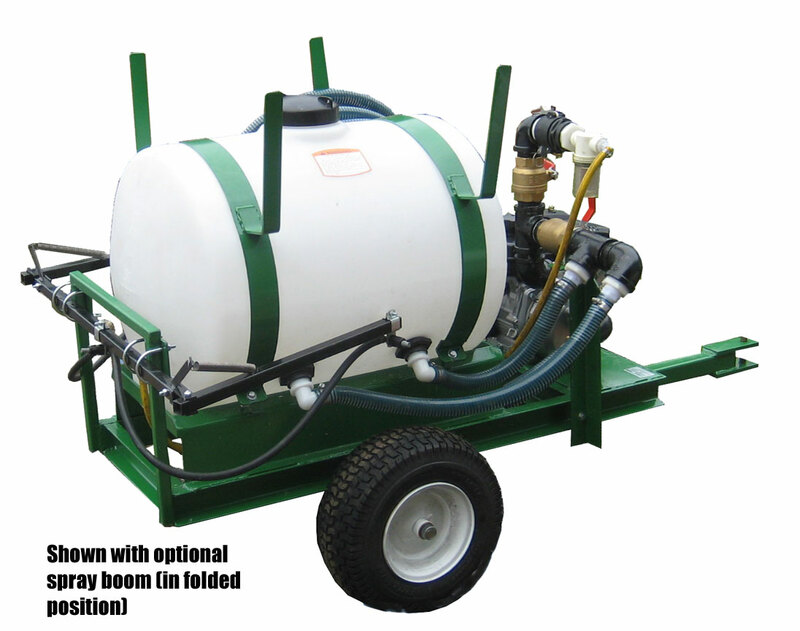 This unit is designed for off road use and is not designed to be pulled on roads or highways. Coverage (sq. ft) 650 sq. ft. 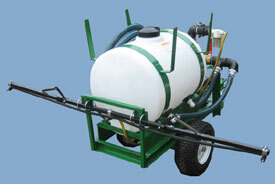 The HS-50-P can be equipped with a boom to use it as a lawn sprayer when you are not hydro seeding. The HS-50-P can also be equipped with what we call a “Seed & Spray” option which is a hose reel and hose for spraying herbicides, insecticides and fertilizers.